10-session program for learning about and discussing the physical and emotional changes of puberty. 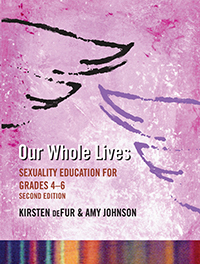 This ten-workshop curriculum is designed to help children ages nine through twelve to gain the knowledge, life principles, and skills they need to understand and express their sexuality in holistic, life-enhancing ways. Like the other Our Whole Lives programs for different age groups, this comprehensive, developmentally appropriate program introduces key topics like values, body image, gender and sexual identity, peer pressure, and healthy relationships with sensitivity and inclusiveness, yet without specifically religious doctrine or reference. The underlying values of the program reflect the justice-oriented traditions of its publishers, the Unitarian Universalist Association and the United Church of Christ, while remaining suitable for use in secular contexts. Maintaining the OWL values and assumptions established in the first edition, the second edition introduces new content, activities, perspectives, language, and resources for today’s children. New topics include body image, social media/Internet, and consent, as well as an updated and deeper exploration of gender identity and roles. Many of the popular activities and discussion from the first edition are preserved here, alongside newer, more interactive activities. Participants will read It's Perfectly Normal by Robie H. Harris.